The Metro Bike Share program launched on July 7 and bikes have since been accessible for monthly and flex pass holders. On Monday, the bike share program opens to everyone — whether pass holders or not — and users will be able to use a credit card to take a bike for a spin. •The regular $3.50 rate will be discounted to $1.75 per half hour to encourage first-time users to give the bikes a try. The discount remains in place until Oct. 1. •To get a bike as a walk-up: find a bike share station in DTLA (map here), tap the screen at the station’s kiosk, follow the prompts, swipe your credit card, select a bike and go. The entire process should take less than a minute. •Nearly 5,000 bike share rides have been taken in the last two weeks. Those numbers should increase very soon — about half the rides on bike share systems in other cities come directly from walk-up sales. •There’s a Metro Bike Share app available on iOS and Android smart phones to help with buying passes, finding a bike share station and checking bike availability. 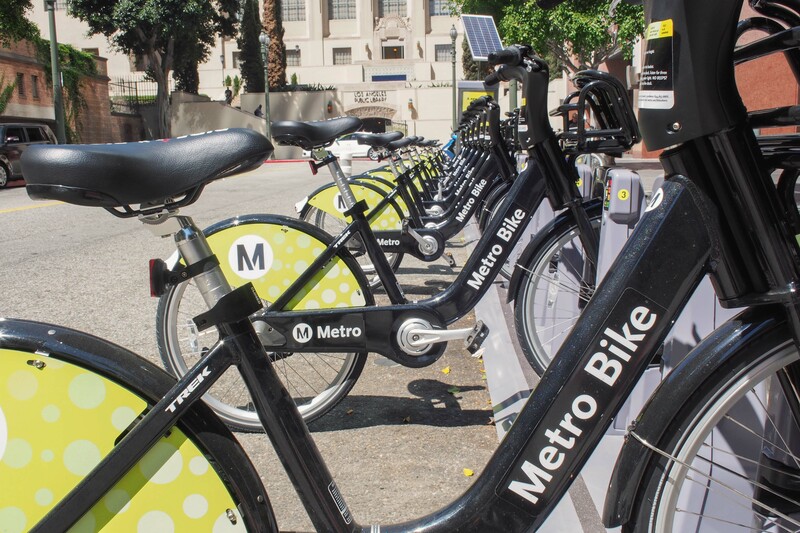 •The DTLA bike share is a pilot project and is the first phase of bike sharing throughout Los Angeles County. Also, any thought to doing things like 3-day passes? I’ve used those in every city I’ve been to with bikeshare and found it incredibly useful as a tourist. Brian: From my experience you’re correct in all of your interpretations of the pricing structure. As you note, the Metro system is much more expensive than Breeze to use for casual riders using walk-up or hourly payment plans. The only plan where the Metro system is competitive with Breeze is for monthly members. If you’re a resident or worker downtown you can use the system every day, for as many bike rides as you want for $20 (as long as no single ride lasts more than 30 minutes). With Breeze the monthly pass is more expensive ($25) and you’re limited to riding the bikes for 90 minutes per day before incurring overage charges. Unfortunately, the annual plan for Metro doesn’t provide any benefit for frequent riders. The annual plan should provide the same benefits of the monthly plan, and should be priced to cost the same as 6 months of the monthly plan ($120 per year). Can a preloaded TAP card work? No, at this time walk ups will accept credit card only. To use your TAP card, you will need to register it at metro.net/bikeshare and load it with a pass. I think it I cheaper to rent a car than using these bikes. Is this program funding the Big METRO bureaucracy???? Where can you rent a car for a month for $20? Only works if You live within DTLA or if your simply handling business in the DTLA area. I work at Sunset & vermont but I see no bike stations in the area…now I would love to be able to take a bike & travel a few miles…drop off the bike & then get back on the Metro.